To kick off this winter’s Madison Magazine Restaurant Week I headed to the Capitol Square with a friend on a Sunday night that already had one bad thing against it — the Packers lost in overtime to the Seahawks in the third round of the playoffs. While the Packers were giving their Superbowl spot to the Seahawks, I was driving to Brocach on the square for a three-course Restaurant Week meal. Before our Restaurant Week courses started I wanted to try their version of the Scotch egg because the one at Cooper’s Tavern was so good. 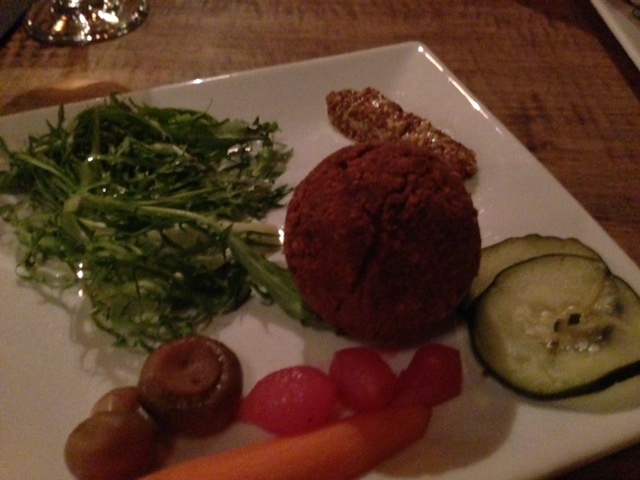 Brocach’s Scotch egg was not as good as Cooper’s Tavern. The biggest problem was the thick batter covering the egg and sausage. The batter was lacking any distinct flavor and so was the sausage. It’s hard to mess up a sausage-wrapped hard-boiled egg, but this one wasn’t great. The pickled vegetables were forgettable. The single best part of the meal came next — the potato croquettes with aged cheddar sauce. Both of us got the croquettes and both of us loved them. 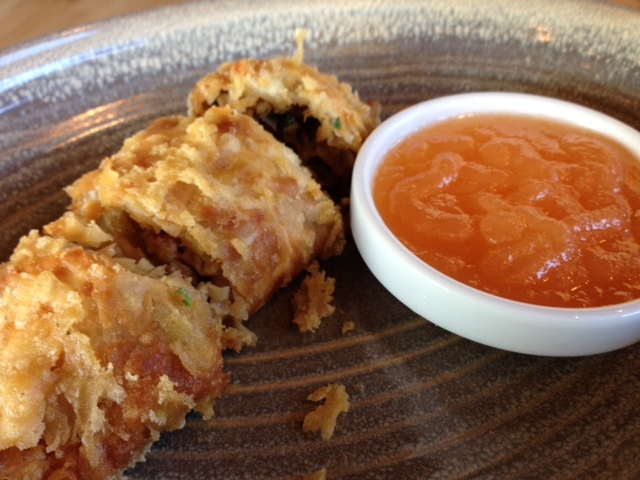 The three golf-ball-sized croquettes were perfectly warm and soft on the inside and crispy on the outside. And the aged cheddar sauced was so good I could have licked my plate…I didn’t, but I did wipe it up with my finger — you know, to try and keep is classy! That’s when the meal went down hill. 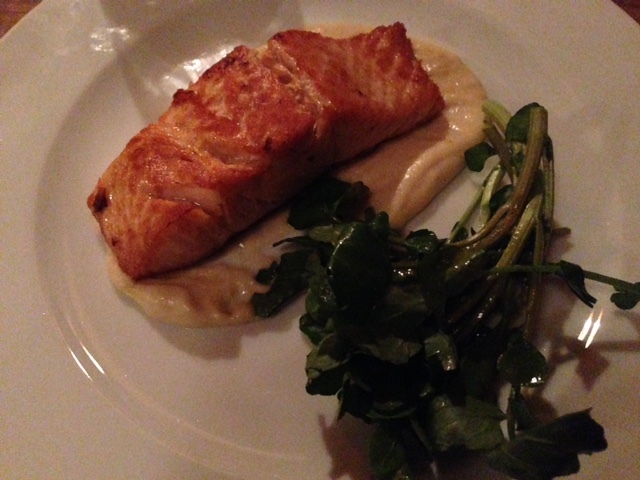 I got the salmon which was crispy, but needed some sort of seasoning and the salad was literally two sprigs of greens. The tangy dressing was good, but considering how cheap greens are I was expecting the salad to be a bit bigger. The puree on the bottom was sweeter than I was expecting (and I don’t remember what it was made of), but it went well with the unseasoned salmon. 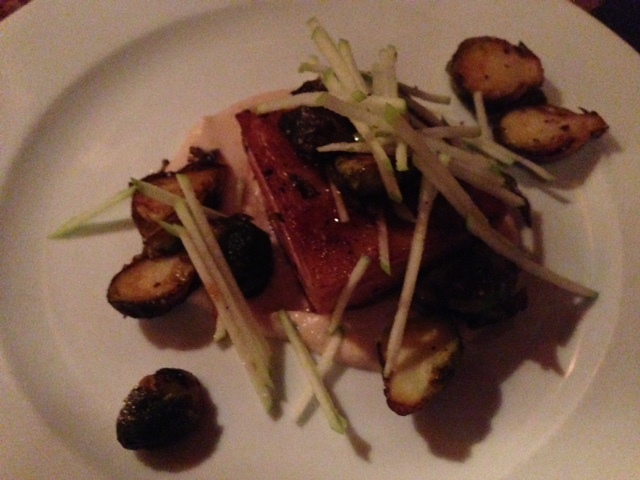 My friend got the pork belly and I got to eat the brussel sprouts that came with it. The sprouts were fine…I’ve had better and I’ve had worse. Her pork belly came with a similar sweet puree under it (did they use the same puree for two Restaurant Week dishes?) and sliced apples on top. It was an interesting dish, but not good enough to bring me back. The dessert options sounded promising, but they were pretty disappointing. 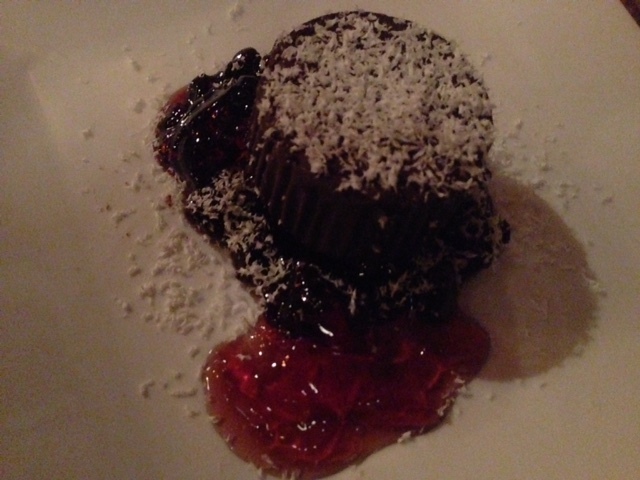 I got the flourless chocolate cake, which was harder than fudge and was almost — brace yourselves — too chocolatey. It was so chocolatey, it was bitter. The berry sauce tasted like bitter, watered-down jam. 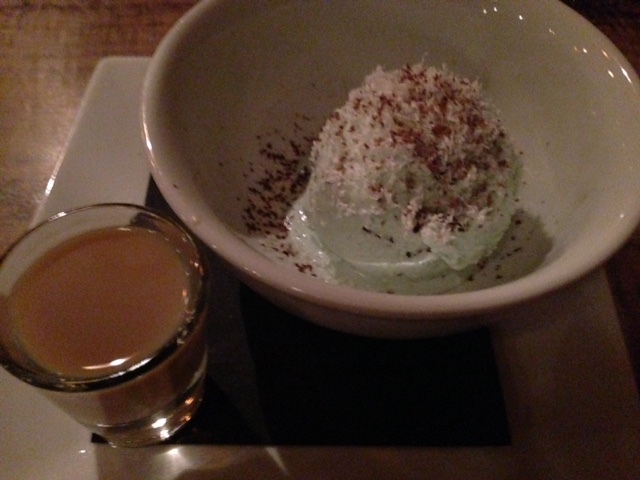 My friend got the mint sundae, which was mint ice cream that came with a shot of Bailey’s you were supposed to pour over the top. I think she liked it, but I say it should have had some hot fudge on it too. 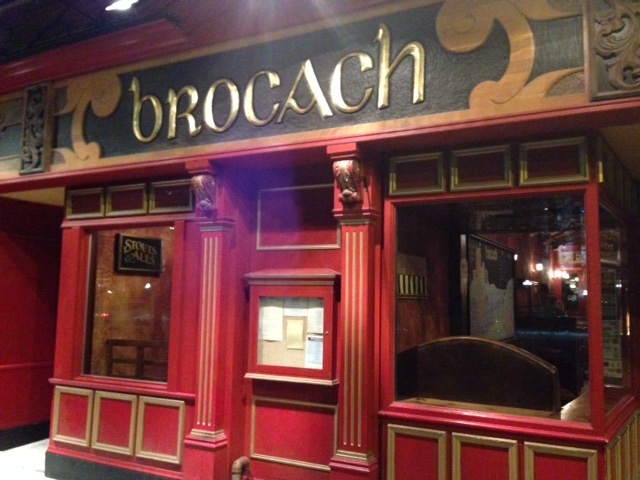 FOOD NOTES: Brocach has been on my “places to eat list” for quite a while and now it’s headed to my “places to avoid list.” The Restaurant Week meal wasn’t bad, but it wasn’t great. 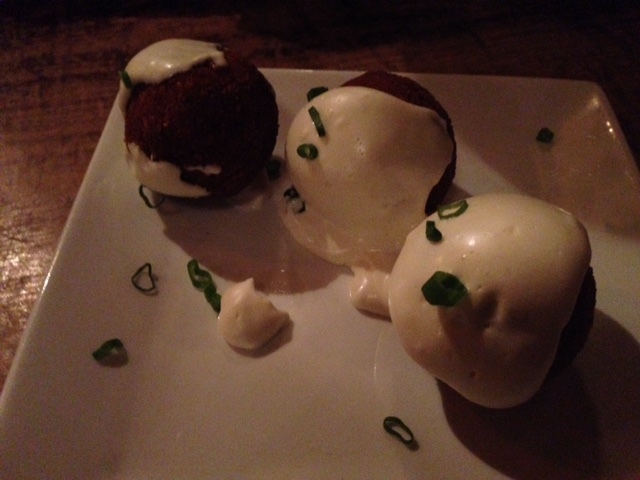 The croquettes were pretty great, but the entrees were OK and the desserts were disappointing. Maybe the negative feelings of the Packers’ season ending loss to the Seahawks influenced the dinner…or maybe Brocach just isn’t that great. Almost everyone in Madison knows about Tory Miller’s Graze and L’Etoile, so I knew his newest restaurant, Sujeo, would open to some hype. 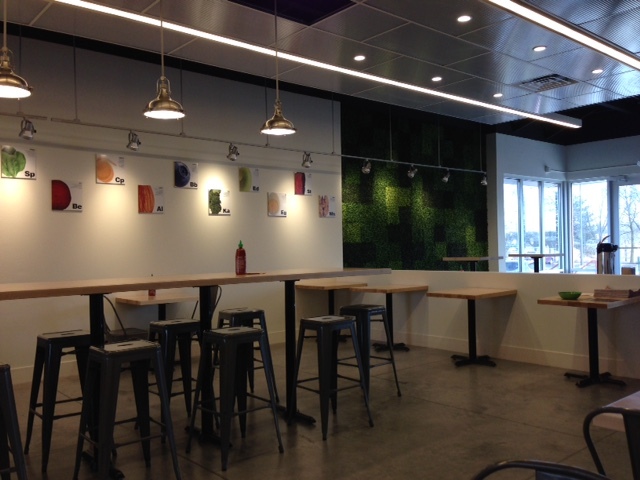 The Asian-inspired, Korean fusion restaurant is in the new Constellation building on East Wash. On a weekday for lunch it was surprisingly slow, but it meant our food came out pretty fast. 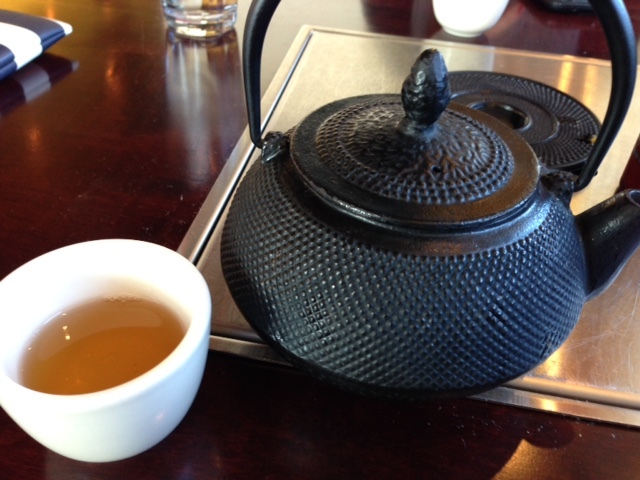 It was pretty cold the day we went so we got some Oolong tea, which was sweeter than other Oolong tea I’ve had, but it still had the dark earthy flavor I expect from Oolong. I went with two friends (Michelle and Krista), so the amount of food I’m about to show you is…well it was still a lot for three of us, but we couldn’t narrow down what we wanted! We started by splitting one of their larger-than-normal egg rolls. The outside was crispy and the cabbage inside was seasoned well and tasted fresh…it was basically a less-greasy version than something I would get at a Chinese take-out place. The other starter we couldn’t pass up was banchan, which is small plates of food usually served alongside Korean food. Sujeo’s banchan ended up being six different type of pickled items and some odd little bowl of pasta salad. The pasta salad was good, but completely out of left field at a Korean-fusion restaurant (and also completely unnecessary – the pickled banchans were more than enough). From what I remember, we got pickled radish (pink ones in the far left corner), cabbage kimchi (middle on the right), cucumbers, the black things in the back were some sort of pickled part of a vegetable and I don’t remember what the first two on the left were…but they were also pickled. 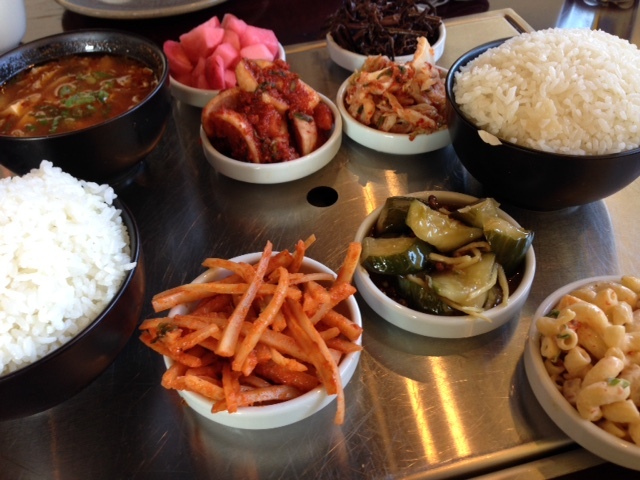 An order of banchan also comes with soup. I don’t remember what kind we got, but I remember really liking it. 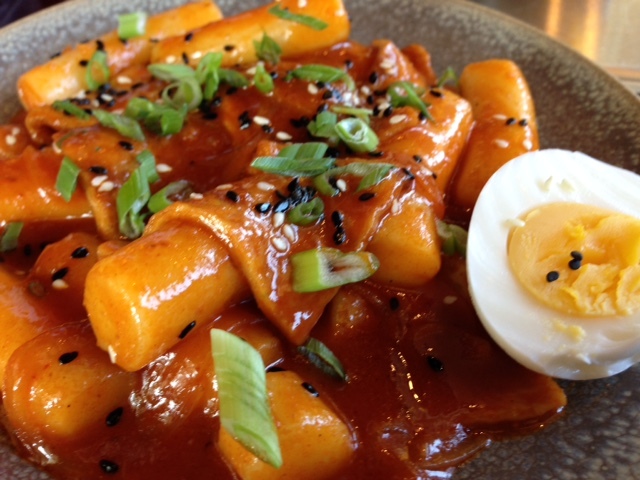 We also got the ddeokbokki, which is spicy rice cakes (they look like thick, round noodles) and fish cakes. The red sauce had a good flavor, but wasn’t as spicy as other ddeokbokki I’ve had. Every time I try this dish I’m hesitant because it has some interesting ingredients in it (fish cakes!? ), but I always end up loving it. 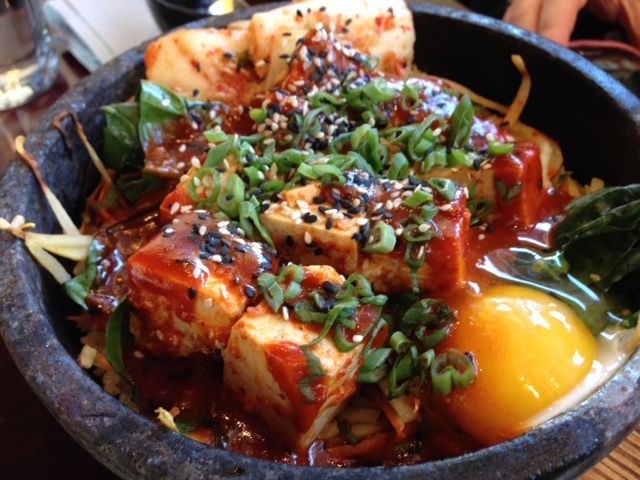 Krista got the bibimbap, which actually came with the raw egg, and was big enough to feed a couple people. Krista also noted it was spicier than she expected. I got the ramen, which was a pretty big disappointment. 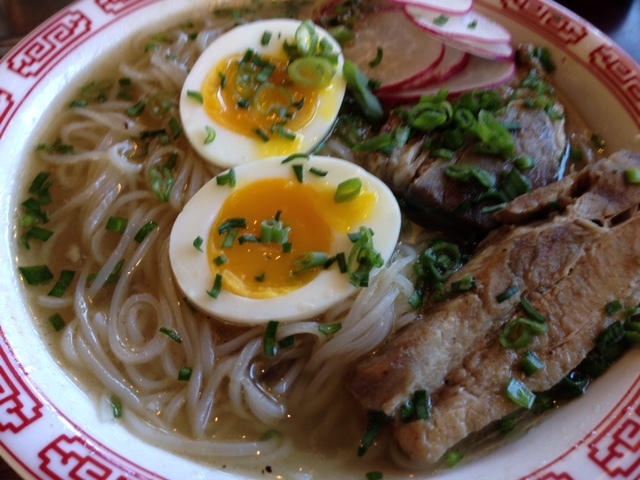 It was rice noodles in a clear, almost flavorless broth with some pork and vegetables on top. I liked the soft-boiled eggs with the pork, but I barely touched the noodles and broth since they didn’t really have any flavor. I was expecting something so simple served at such a unique restaurant to be super flavorful and unique, but this was definitely neither flavorful or unique. I had originally considered ordering the japchae, but changed my mind for some reason, which was a bad decision. Michelle got the japchae so at least I got to try it, but I wanted the entire thing (unfortunately I forgot to snap a pic). The japchae is sweet potato noodles, veggies, beef and bacon. I really liked the hearty flavor and the al dente veggies helped keep it from being too heavy. Michelle said it was not the traditional version of japchae, which I’m guessing was the reason I liked it so much…because it had bacon and other fusion flavors in it. FOOD NOTES: Sujeo was a fun place to grab lunch with some girlfriends and get to share a bunch of new dishes. I wouldn’t recommend it for someone who is looking for traditional Korean food, but if you’re looking for some good food with some new flavors and options — Sujeo is a good place! Avoid the ramen, period. When I go back I’ll be getting the japchae, but I would also like to try their dim sum carts on the weekends. I’m always looking for healthier options when it comes to getting food on the go, so the prospect of a super healthy restaurant right off the main road I drive every day was really exciting. The two concerns I had about Freshii when I went to try it with Michelle was that the food would basically be a more expensive version of what I already make at home, and it wouldn’t actually be as healthy as I wanted it to be. 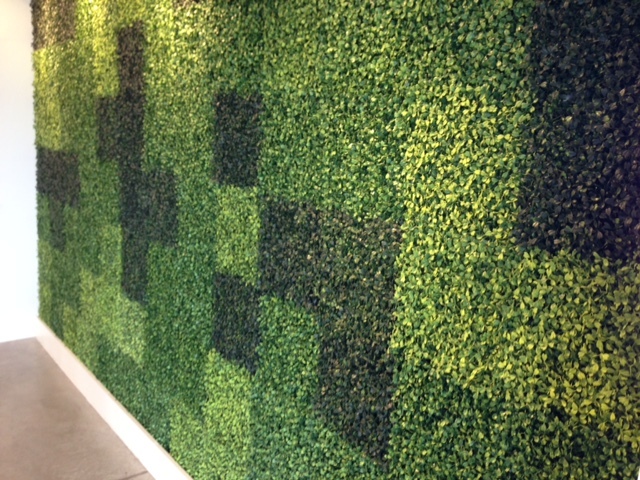 And unfortunately, Freshii had issues with both of these concerns. In general, everything we got had high and low points (some had lower points than others) and everything had a focus on healthy ingredients. However, everything was also a lot higher in calories than if I had made it myself at home, and everything was also pretty pricy. Don’t get me wrong…if I’m in a pinch and need something to eat, I will definitely choose Freshii over the other options on the west side. 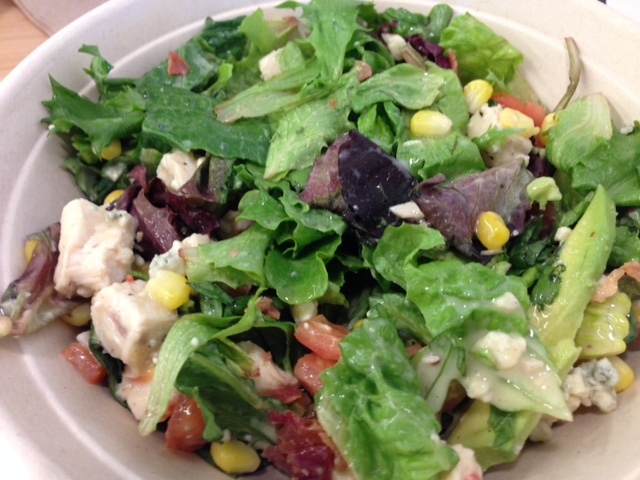 Freshii offers soups, salads, wraps, burritos, bowls, smoothies and juices. 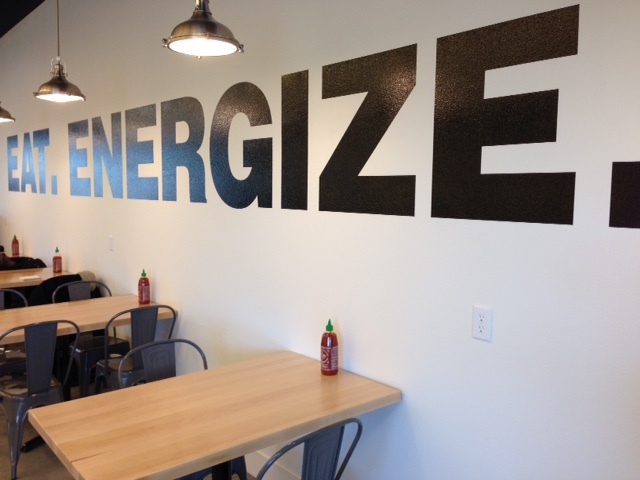 We got to try a couple different dishes and by far, my favorite was the teriyaki bowl. 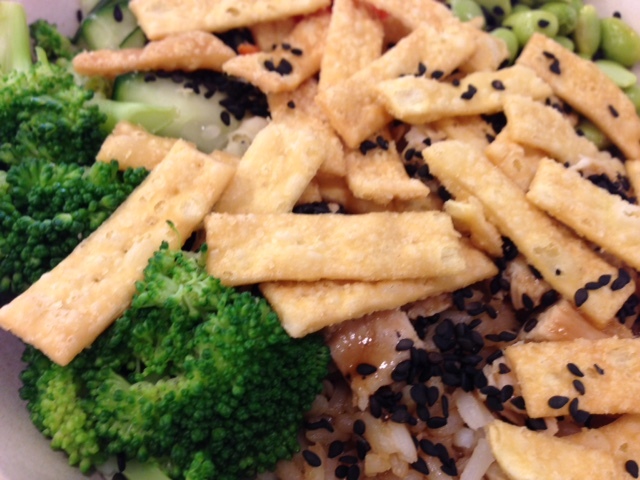 It has brown rice, broccoli, carrots, edamame, green onions, crispy wontons, chicken and teriyaki sauce. I believe most of the options come vegetarian and you can add tofu, chicken, steak, shrimp or falafel…but another thing to note is that adding a protein does cost extra. The teriyaki bowl has over 600 calories without the chicken…that’s a little high for something that’s supposed to be super healthy. But I did enjoy the brown rice, edamame, al dente veggies and the teriyaki sauce. The bowl was filling and the ingredients were indeed fresh. 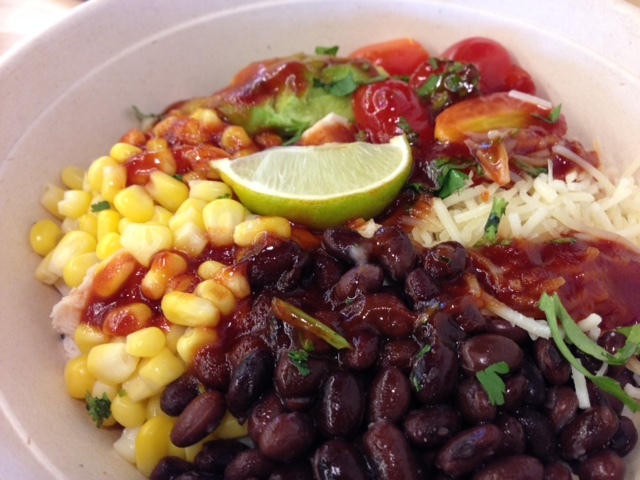 We also got to try the pangoa bowl which has brown rice, avocado, black beans, shredded cheese, corn, grape tomatoes, cilantro, hot sauce…and ours had chicken in it. This one was basically a smaller, less flavorful version of a Chipotle burrito bowl, plus their hot sauce was thick and not very flavorful, and their avocado was hard as a rock. The cobb salad looked promising when we started digging in, but the heavy honey dijon dressing and lettuce slightly past its prime did not impress me. In addition to also having rock-hard avocado, it had blue cheese, which I really don’t like. The smokehouse burrito was also a sub-par version of something you could get at Chipotle. 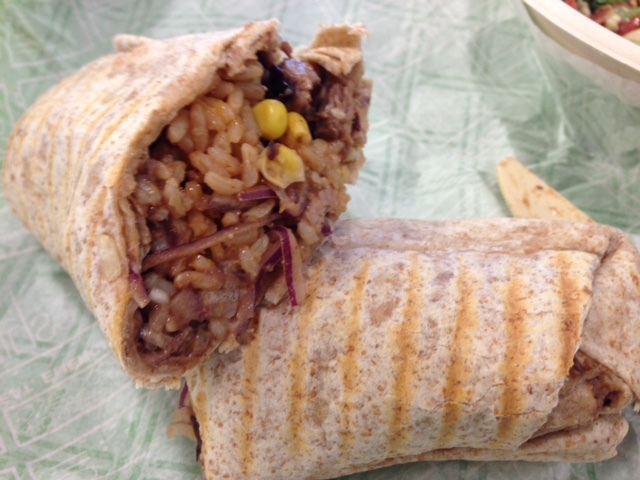 It had brown rice, black beans, red onions, tomatoes, corn, shredded cheese and what the menu called “fiery barbeque.” I’m not sure there was even any barbeque sauce on the wrap…and if it was on there, there was nowhere near enough of a flavor to call if fiery. It was basically a brown, mushy wrap with no distinctive flavor…all for more than 730 calories. 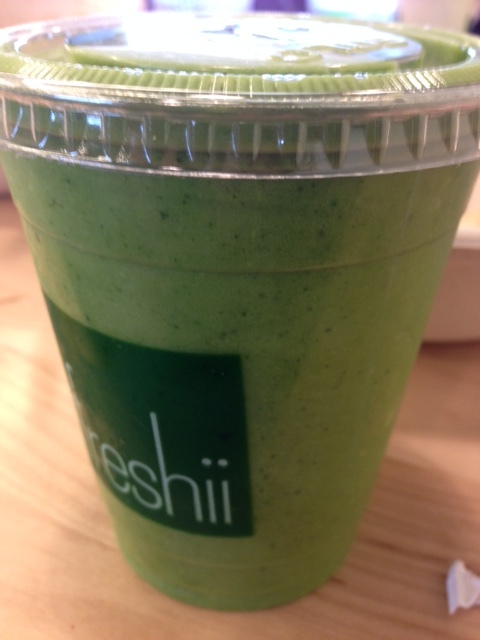 The other thing that I very much enjoyed was the Freshii green smoothie with kale, spinach, pineapple, avocado and low-fat frozen yogurt. It was surprisingly refreshing and light…and tasted nothing like the green ingredients that were in it. The smoothie has just over 250 calories in it, and I’m told they can add protein powder…which also probably costs more.